I know my metamorphosis into a British person has by now been fully complete. Why? I queue, I say ‘excuse me’, ‘sorry’ and ‘oh dear’ all the time – and I constantly talk about the weather. Well the latter can be excused, considering that it’s been raining non stop for the past 48 hours! Proper rain, proper cold autumn rain. Seriously, I feel like living in an eternal October. It’s horrible, saddening and plain bad for your mood! But it has one good thing: it’s cool enough to turn the oven on without melting in August. Yipee! My oven becomes my ally in the fight against weather-related moodiness. Together we create the loveliest cakes, sweet smelling cinnamon crumbles, deep flavoured chocolate brownies and, this time around, tangy orange drizzle teacakes. 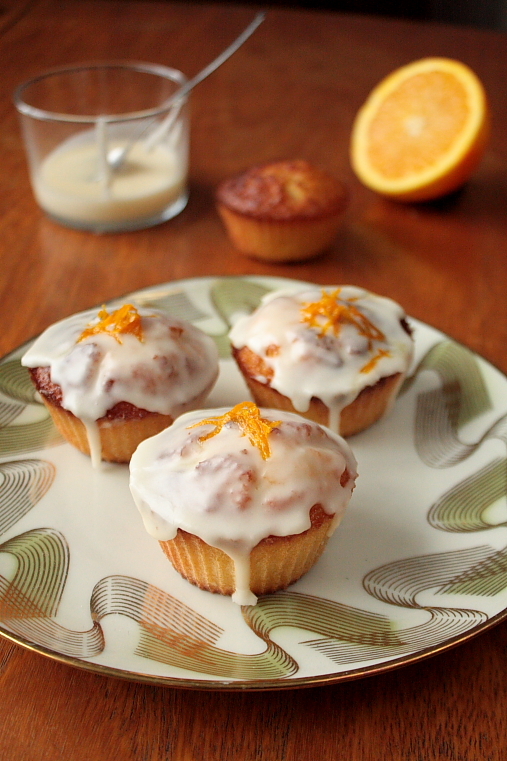 I’ve always been a fan of simple lemon and orange cakes. The flavours blend in perfectly with a sweet buttery cake and, topped with a tangy icing, they have the ability to properly excite your tastebuds: sweet, sour, buttery, rich, moist – heaven. These cakes are extremely moist and their texture is pretty dense. You may think they’re not fully baked when you cut them in half, but as long as there are no runny dough spots left, it is actually done. Beat the butter and the sugar until creamy. Add the eggs and keep on beating for a minute. Press the oranges, set aside 4 tbsp of the juice for the icing. Now add the remaining juice to the butter mix. Add the flour, baking poweder, orange peel, honey and ginger and mix well. Divide the liquid batter between about 12 cupcake moulds (fill them each to the brim, since they won’t rise much). Bake for 30 minutes or until nicely golden brown on top and a toothpick inserted comes out clean. Let the cakes cool down before you ice them. Perfect treat for rainy summer days, Anne! Perfect, as Berlin shows up very british these days. Oh no, I was hoping at least Berlin was sunny and warm! We have to be strong now and brave the crap weather! Hopefuilly there’s an Indian summer in store for us later this year! I say – you are anything but British! ;o) It’s been pouring here too but these teacakes are a lovely sunny interlude in my day! I remember when I first started feeling like I was morphing into a French person… isn’t it funny how quickly we can adapt to foreign quirks? Love the cake photos… definitely one for the books! Thanks Emiglia! I think you should embrace turning into a French person, vas-y! but oh, dear….those orange teacakes look sooooo delightful, I’m sure they can easily lift up one’s bad mood. Yeah, I wish there were some left! But hey, today the sun’s come out again, so I guess no more need for mood-enhancing cakes! These look crazy good!! They would not survive a sunny day in my house, no less a rainy one… I like the idea to serve them for brunch. Yummy. These look so good. So where did you move from? These look delectable and I love that adorable mini cheese grater. Lovely as always Anne! 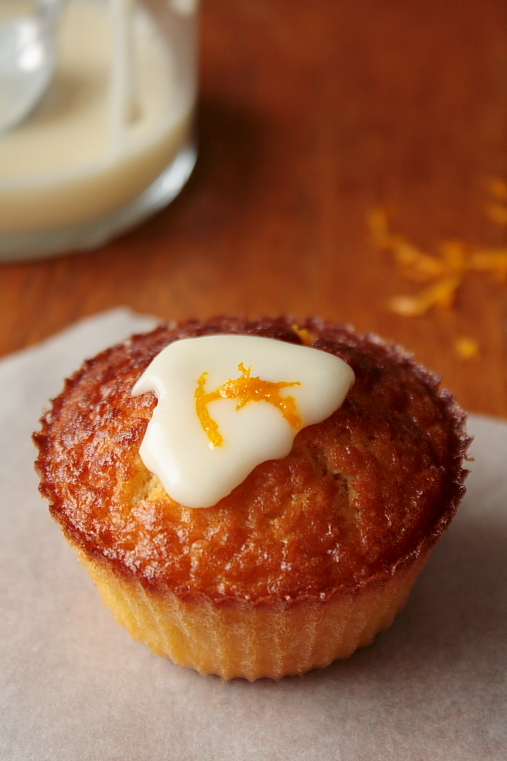 I love orange in cakes and these look SO good!! How fabulous. Was wondering only last week about the possibility of orange drizzle cake – and you have given me a quite delightful answer!